Yamato: the Drummers of Japan will return to the UK following their hugely successful 2017 tour. 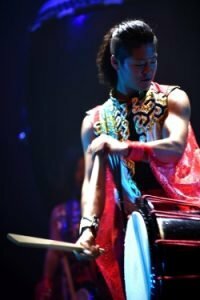 From February 2019 audiences across the country can experience Yamato’s innovative style; combining traditional Taiko drumming with spectacle and athleticism. Next spring Yamato will bring their unique style of performance back to Britain for an 18 venue tour – from 15th February to 31st March – presenting a production never before seen in the UK. The 12-strong Taiko troupe will make a return visit to some venues as well as stopping off in new cities spanning the country. Press night will be held at the Brighton Dome on 15th February. Yamato formed in 1993 with the aim of preserving the tradition of Taiko drumming whilst exploring new possibilities for the majestic instrument, the wadiako, and to create endless opportunities for the rich reverberations to be heard worldwide. Recognised as trailblazers in the Taiko world, Yamato has broken from the patriarchal confines of the style by including female drummers in the troupe from inception. Since then, the troupe has performed in front of 7 million people in more than 54 countries across the globe. Perhaps more physically demanding that any other drumming style, performers must not only learn the traditional technique but also engage in an intensive endurance training programme. Taiko drums can weigh up to half a ton and to strike them effectively requires the full strength of a well-trained body. Yamato’s troupe starts each day with a 10km run and vigorous weight training to keep themselves in peak physical condition and maintain the fitness needed for their nightly 2 hour performances. In this brand new show “Passion” or “Jhonetsu”, the drummers will challenge themselves to their absolute limits both musically and physically. With a show designed to instil audiences with the exhilarating and explosive energy of Taiko, this promises to be their most ambitious and spectacular show to date.